Be Your Best – From beginners to black belts, we train our students to achieve their best. As a student, you’re looked upon as an individual and will never be compared to someone else. You don’t need to be in the best shape of your life and no prior experience is necessary. All you need is the right attitude and a desire to do your best…the rest is up to us. Your success begins with the willingness to try. Begin Your Journey – Making the first step is easy and the best place to start is with a couple of introductory classes. You’ll experience, first-hand, the excitement and challenge of K.I.C.K. MASTERS KARATE. Through these lessons you’ll have the opportunity to not only meet one-on-one with the instructor, but to see all the benefits and advantages of how K.I.C.K. MASTERS will change your life physically and mentally. Developing self-confidence will teach children to respect themselves and, most importantly respect others. It will give them focus, dedication, motivation and a non-quitting spirit. These traits, learned by training and working hard, not only will help them in the Dojo, but will give them the confidence to know they can be successful at anything they put their mind to…especially schoolwork. Our philosophy is simple. – Discipline. Results. Achievement. Confidence. Success. Each of these virtues are not, and cannot be achieved without the other. Success depends upon the eagerness to be disciplined enough to see results, to achieve your goals and to become self-confident as a result of accomplishing your first goal…TO SUCCEED! Karate & Kick Boxing classes are available in Stratford for children and adults. Daytime and evening classes offered all year round on various weekdays. Please contact KICK Masters Karate & Kickboxing for exact class hours for different age groups. Would you like more information on hours, classes and programs available at KICK Masters Karate & Kickboxing? Please contact the school with your questions. Update the details, Write a Review or Report Error of KICK Masters Karate & Kickboxing. This Chart shows the Martial Arts Styles offered most in Stratford, Canada area. 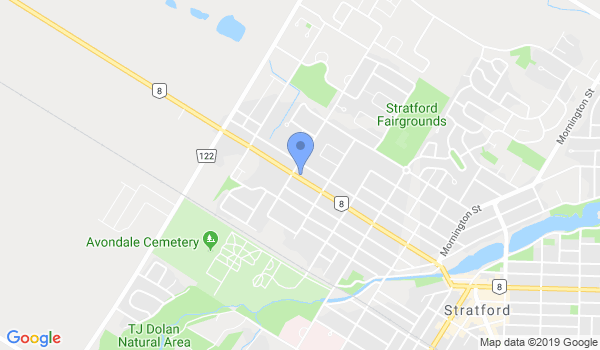 View a list of Dojo in Stratford, or enter your address below to find schools closest to you.